The battle for a toll free country is over, though the issue of fair justice for the Skye campaigners who were treated as criminals will remain. Though Scotland is now free of tolls, they could return as "congestion charges" or "road pricing" imposed from London. They may also return - on bridges and roads - using the "road user charge" powers that Scottish local authorities have (subject to veto by the Scottish Government) under the Transport (Scotland) Act 2001, though both the SNP and the Tories are opposed to this. On the 8th February 2007, MSPs had a chance to remove the tolls as Tricia Marwick from the SNP had put down a motion to remove both remaining tolls. The old Executive defeated the motion by 65 votes to 58 with 1 abstention. It was a sad day for Scotland. The tolls were soon again an issue in the May 2007 elections, and however the candidates or their party had voted in February, a majority of candidates now said that they were backing the removal of the tolls. But it was mainly the SNP that adopted the removal of tolls as one of their policies. The election result was very close. The main parties did slightly worse than in the May 2003 election, with the exception of the SNP who increased ther seats from 27 to 47. Labour had fallen from 50 seats to 46 seats, and after some discussion the Labour / Lib Dem coalition resigned and was replaced by a SNP minority government with support from the Greens. On the 23rd May the new First Minister announced to the Parliament that the removal of the tolls would be a priority and on the 31st May the Government moved that the Parliament agree the principle that the tolls be removed. The other parties agreed to the principle but with a string of qualifications. On 4th September 2007 the Abolition of Bridge Tolls (Scotland) Bill was put before Parliament and then considered by the Transport, Infrastructure and Climate Change Committee who endorsed it though some members seemed reluctant and the "experts" that the Committee heard said that the roads would grind to a halt and the world would end if tolls were removed. Despite this on the 15th November the Parliament approved the Bill in principle and gave its final approval on 20th December 2007, though we had to wait till the 24th January 2008 for the "Royal Assent". The Minister then lost liitle time in signing the order naming the date. Links: The main page including links to the Bill and written and oral evidence to the Committee The alliance's evidence to the Committee (pdf file) Details of how to submit evidence to the Committee (It is now too late as the deadline was 5th October.) Official Report of Committee meeting on 11th September Official Report of Committee meeting on 18th September Official Report of Committee meeting on 25th September Official report of Committee meeting on 2nd October. There were various other meetings where the Committee considered the Bill but no details are available as they considered the Bill in private. Debate and vote in Parliament on 31st May Debate and vote in Parliament on 15th November Debate and vote in Parliament on 20th December. There were two consultations during the Executive's review of tolls. Following the 1st March 2006 decision to keep two of the tolls, the Executive announced a "study" and another consultation! The Executive appointed consultants on 6 September 2006, to "carry out a detailed study of the economic, social and environmental costs and impacts of retaining or removing the Tay and Forth tolls. The study will focus on the impacts of the tolls on the economy and local communities in Fife and Dundee; will also study wider impacts, on the Lothians and nationally; and will follow the principles set out in the Scottish Transport Appraisal Guidance (STAG)". The consultants were a London company - Steer, Davies, Gleave. They had represented various organisations that want increased tolls. They were also hired to do a study on the Humber bridge tolls. The Humber bridge is the most expensive (�5.40 for a car making a return journey) in Britain, and there was and is a lot of local opposition to the tolls, particularly from those travelling across the bridge to hospitals. Despite this they recommended in March 2004 - "Retain tolls and continue to increase them in line with inflation" - (See para 8.11 of report). Our alliance was very disturbed. There are no prizes for guessing what the results of this study for the Executive were intended to be. The real issue was and is justice and fairness for Fife and Tayside, but this was bound to be ignored. A draft report was to be ready by 11th December 2006. But the old Executive never bothered to publish anything. Once we had a new Executive / Government following the May 2007 elections we wondered if the report would be published or binned. In the event it was eventually published on the 17th August - Toll Impact Study. It seemed that some attempt had been made to reflect the change in Government, but it was still a waste of time and money. The old Executive had allowed almost no time for public consultation by giving a deadline of 17th August 2006 for submissions. For a long time the Executive refused to even say how many submissions there were and delayed publication of them till February 2007. There were 89 submissions and according to the Executive's own analysis - 5 were "indifferent" to what happened to tolls, 6 wanted to keep tolls and 78 wanted tolls removed. Those that wanted the two tolls kept are the Forth Bridge Authority (though the board did not see the response till after it was submitted), a bus company, 2 organisations and 2 individuals. Those who wanted tolls removed include Dundee and Fife Councils, the Tay Bridge board, and business organisations. Our submission is here. Fife Council's submission said that "... It is difficult to understand the need for yet further study by independent consultants. However, the issue is no longer about the environmental, economic or social accessibility matters concerning the tolls.... The issue now is quite simply about fairness and equity between the South East of Scotland (Fife in particular) and the rest of Scotland." Though otherwise the position of Fife Council is ambiguous. They have made some clear statements against the tolls, but have made others that appear to endorse them. They have done almost nothing to get the tolls removed, and through their membership of the Forth bridge board appear to have asked for the tolls to be kept and even increased. Dundee City Council's submission said that they would " ... provide factual evidence with regard to our case and desire to have the tolls removed from the Tay Road Bridge because of the negative effects on the economic, social and environmental well being of the city.... The Policy and Resources Committee of 14 August ... has unanimously affirmed the call to have the tolls removed from the Tay Road Bridge." The Council also submitted a report - 455-2006. The Tay Bridge Board called for the tolls to be removed. The response of the Forth bridge board (FETA) was quite different. Despite the fact that they have 4 representatives from Fife Council, FETA told the Executive that they wanted tolls increased and that ".. the removal of tolls from the Forth Road Bridge would increase the levels of traffic using the crossing leading to a significant increase in the current levels of congestion. This would have a negative impact on journey times and environmental conditions, as well as exacerbating the problems of maintaining and operating the bridge." Not a single Fife Council representative argued with what was being done in their name. Edinburgh's submission was what you might expect from the councillors who tried to con the people into accepting "congestion" tolls. Initial findings of the Study and links to all the consultation responses. On 15th May 2003 "A Partnership for a Better Scotland" was published. The Transport section included "Reviewing existing bridge tolls in Scotland and entering into negotiations with a view to ending the discredited toll regime for the Skye Bridge." Various organisations were consulted in July 2004 as part of the review. SKAT (Skye and Kyle Against Tolls) was one of the consultees, but SKAT replied that they feared that the exercise might be used as an excuse to delay the ending of the Skye bridge tolls. A report on "Phase One" of the review was published on 29th October 2004, and the Skye tolls were removed on 21st December 2004. In 2006 we asked the Scottish Executive what submissions were made by Angus, Dundee, Edinburgh, Fife, Perth & Kinross, and West Lothian to the first Toll consultation in 2004. The Executive's website had indicated that there was a response from all 18 councils that were consulted. The Executive told us, that were in fact no formal submissions from any of these councils. We found this quite amazing. The collaboration of these councils with a tolls regime contrasted with councils on the west coast. The Skye campaign was backed by the Highland Council, who sponsored research into the tolls by Napier University. Similarly the Erskine bridge campaign was backed by all the Clyde councils - particularly Renfrewshire and West Dunbarton. In April 2005, the Executive issued another "consultation" document. The document asked various questions which presupposed that the other three bridges would stay tolled!. Our views submitted to the Tolls Review All the Submissions to Phase 2 of the Tolls Review Summary of the Submissions. From the summer of 2005 through to the end of February in 2006, we lobbied various politicians. And in December 2005 we started a petition against the tolls:- Press Release in December 2005 when we started Petition to MSPs. We also contacted MSPs and councillors, e.g. - this is message sent to MSPs on the Executive on 28th February 2006. All of this had little effect as on 1st March 2006, Tavish Scott, the Transport Minister told MSPs that he would not attempt to keep the Erskine Bridge tolls, but he was keeping the Forth and the Tay:- Official Report of what the Transport Minister told Parliament. You can see more of the reaction in early March 2006 on the Scotland News page. The announcement was followed on 8th March 2006 by the publication of the report on "Phase Two" of the review (Content and links) Report Summary Whole Report in pdf format. An interesting part of the main Executive report is Appendix B "Technical Issues". It was claimed that tolls had to be kept to reduce congestion. But if you look at Appendix B and compare figures 4 and 5 (congestion before and after Forth bridge tolls are lifted) and figures 7 and 8 (congestion before and after Tay bridge tolls are lifted), you will find it hard to see any difference. You may also notice that the figures were only published for the morning peak. This is of course the period when delays caused by toll collection (particularly on the Tay) are at their minimum. On the 9th March the Minister signed the Order to keep the Forth tolls. In the 2003 to 2007 session two MSPs introduced bills to abolish the tolls. The first Members' Bill was promoted by Bruce Crawford, one of the regional MSPs for Mid Scotland and Fife. Mr Crawford's Bill was to remove the Forth and Tay tolls - Details of Mr Crawford's Bill. Mr Crawford tried to get his Bill considered without consultation. He and most other people thought that there had already been enough of that, but on the 30th May the Local Government and Transport Committee delayed his Bill, by demanding that he go through a consultation process (5 Labour and Lib Dem MSPs outvoted two SNP MSPs, one Scottish Socialist and one Tory). Responses to the consultation had to be submitted to the Scottish Parliament by 30th August 2006. Then on the 11th September it was revealed that the Bill would not be considered before May's elections due to a "blunder by Holyrood officials". We don't know who was at fault, but the rules are that any consultation has to be finished before a proposed bill can be published in the Parliament's Business Bulletin. There then has to be a full month before any Member's Bill can be introduced. And due to May's election that introduction had to be before the end of September. Unless Mr Crawford was a superman or could borrow a time machine, it seems that this process was scuppered before it started. Once again it seems that either the MSPs or the officials or both had succeeded in kicking the tolls issue into the long grass. Mr Crawford's consultation had set out 8 simple questions, these were our answers:- 1. Do you agree that tolls on the Forth Road Bridge should be removed? 2. Do you agree that tolls on the Tay Road Bridge should be removed? 3. If tolls are removed how should the maintenance and improvements for the Forth and Tay Road Bridges be funded? - By the Executive. Roads users pay in taxes about seven times more than is spent on the roads. The cost of the bridges is almost nothing compared with the total Executive budget. 4. Should the Scottish Executive pay for the outstanding debt on the Tay Road Bridge ? If not, how should the debt be paid? - Yes. The amount of debt is insignificant compared with the Executive budget, and there is actually a fund surplus on the Forth road bridge. 5. What is your view on the economic impact of removing the tolls? - Positive. The removal of the cost of tolls and the elimination of queues to pay tolls will be a big boost to many firms and will encourage tourism. 6. What is your view on the environmental impact of removing the tolls? - Positive. Reduction in queues to pay tolls will reduce vehicle emissions. 7. What is your view on the social impact of removing the tolls? - Positive. Tolls act as a psychological barrier to people visiting friends and family. They also disadvantage people travelling for higher education, hospital treatment, work and leisure. 8. Do you have any comments on the Draft Bill and the Explanatory Notes? The economies of Tayside and Fife should be allowed to flourish without imposition of a Post-code based taxation - I firmly believe that the cost of transportation is a factor for firms deciding on their location in Scotland. Paying to get to and from your place of business every single time you or your customers wish to interact is bound to have an adverse affect on your thinking. Despite the green lobby comments on cars and the damage caused by them, we all know that a car engine is at its' most efficient when moving. This is a fact recognised by all concerned, so it is clearly in no-ones interests to create artificial bottlenecks in what should be a free-flowing traffic system. The continuing spiral of living costs in Edinburgh and burgeoning population in that area is forcing buyers to travel further afield to find homes. The traditional occupations in Fife and Tayside of heavy industry, mining and fishing have all gone now and will not return, as a result whole communities have been decimated, towns have fallen into disrepair and the working populations have to spend more time travelling to their place of employment putting pressure on the already limited transport infrastructure. By removing the tolls, I firmly believe that firstly travelling times would be reduced, secondly that industries may be more prepared to locate to these areas and thirdly that a more mobile population would see a more even distribution of wealth to the less privileged areas of Fife and Tayside. I believe that the bill does represent the feelings of the majority of us that have to endure the misery of the daily crawl to work. I commend the proposer for having the strength of his convictions to raise this issue and I sincerely hope that he is successful. In closing I would say that I have lived in Dunfermline for approximately 30 years now, I have commuted to Edinburgh since 1979 - originally by train as that was most convenient and for the last 10 years by car as my current employment requires me to visit clients all over Scotland. In light of my job, car sharing is not an option as my hours are too irregular. In that time, I have faced increasing costs of travel, larger queues of traffic and longer working hours. At the same time, I have observed the decline of my standard of living as my home town builds more and more houses and less and less facilities to cope with them. Hospitals closed or downgraded, schools closed, town centre falling into disrepair and jobs disappearing - I depend on Edinburgh for work, I socialise there, I shop there and then I pay for the privilege of returning to my home. If I were a spoilt child, at this stage I would stamp my feet and scream IT'S NOT FAIR. And the truth is, tolls are not fair. They have been removed in the West of Scotland (quite rightly), they have been removed from the Skye Bridge (quite rightly) and it is time they were removed from all of Scotland - I urge all members of the Scottish Parliament to act in the best interests of all of the people of Scotland. Helen Eadie, Labour MSP for Dunfermline East, also submitted a similar Bill. It was then reported that she had withdrawn it, as there was not enough time before next May's elections. In fact it appears that the Bill was not withdrawn, though it was in any case submitted too late to be considered in that session. The Erskine bridge crosses the Clyde at the western edge of Glasgow between West Dunbartonshire and Renfrewshire. It opened on 2nd July 1971. Unlike the other toll bridges, it was the direct responsibility of the Scottish Executive. It was announced on the 1st March 2006 that the tolls would stop at the end of the month. The toll for cars was the equivalent of 120p for the round trip. The original intention was that tolls would have ended in 1991. But there was a "temporary" power to continue tolls. In the event this "temporary" power was extended, but lapsed on 1 July 2001. Tolls however continued to be collected between 2 July and 30th August. There was then a 2 week period from the end of August till the passing of a new Act when tolls were lifted! In September 2001 the Scottish Parliament passed as an "emergency" measure the Erskine Tolls Act 2001. What was astounding was that only SNP MSPs opposed this Act. We believe that there were Labour MSPs who opposed it, but must assume that they had been told how to vote:- report of Parliament on 6th September 2001. The Act gave retrospective authority to the illegal collection and allowed tolls to continue till July 2006. They could have extended the tolls for further 5 year periods ad infinitum, providing MSPs approved an Order each time. According to the Executive there were 10,074 thousand crossings in the year to March 2006, the last year of the tolls. The Erskine Bridge was a goldmine. Nicol Stephen, the Scottish Transport Minister in answer to a question on 19th November 2003 said that the bridge had cost �10.7 million to build. The income in the first year was only �195 thousand, but by 2002/03 it had grown to around �5.4 million. Giving total income between July 1971 and March 2003 of �72.4 million. By the end of March 2006, it will have reached about �90 million, so the people and businesses that used the Erskine Bridge paid in tolls MORE THAN EIGHT TIMES what the bridge had cost to build. The accounts show the bridge made a profit of �2.8 million (the previous year had been a loss due to unusually high refurbishment costs). The unused surplus on the bridge at the point that the tolls were removed was �22.5 million. The cost of collecting the tolls and administration was just under �0.8 million for the year. Most people crossing the Clyde did so at other (untolled) bridges and tunnels, and therefore it was only a small number of people that paid the toll. As with other toll roads around Britain (and the world) those that don't pay tolls tend to be blind to their unfairness. Both Renfrewshire Council and West Dunbartonshire Council actively campaigned for the removal of the tolls and in June 2005 both the councils petitioned Parliament and the MSPs were addressed by Councillor Andrew White from West Dunbartonshire Council. We contacted the councillors to ask them to lobby the Executive. Here is one message sent to West Dunbarton & Renfrewshire councillors on 15th February 2006. The area's MSPs had also called* for the tolls to be scrapped and stressed the "significant economic, environmental and social benefit that would be gained by removing the tolls". The support of all the MSPs was crucial, as it is them who would have decided the fate of the tolls. * Apart from the SNP MSPs this was a change from 2001 when they had acquiesced with tolls being reinstated. The bridge across the Firth of Forth linking Fife to Lothian opened on 4th September 1964. It was a tolled bridge, though the intention was that tolls would be lifted when the construction cost was paid off. Tolls originally had to stop by May 1995, but the authorities in a series of orders had the life of the tolls extended to 1998, then 2003, then 31 March 2006, then March 2010. Following the Abolition of Tolls Act, the bridge at last became toll free from Monday 11 February 2008. According to the bridge authority there were 11,840 thousand northbound crossings in 2006. This would give a both ways figure of around 23,700 thousand. The one way figure for previous years was 11,900 thousand in 2005, 11,780 thousand in 2004, and 12 million in 2003. The figures seem to indicate two things, firstly that bridge traffic has not risen in recent years, secondly that the last toll increase (early in 2005) had little or no effect on the volume of traffic. Though the power to collect tolls was due to end on the 31st March 2006, on the 1st March 2006, the Transport Minister told MSPs that following the review he had decided to again extend the power to collect tolls. To paraphrase Adam Smith once the Government have got you, they won't let you go! Then on the 9th March the Minister "signed" the Order to extend the tolls for at least 4 years. This was despite widespread protests from councillors, MSPs, businesses and the public. Since 1 September 1997, the toll is only payable northbound (going from Lothian to Fife) and from May 2005 the toll for cars has been 100p. In November 2005 the bridge authorities submitted plans to the Executive for "Road User Charges" which would have increased the Forth Road bridge tolls to �4 for vehicles crossing between 4PM and 6PM. There was then a short period of "consultation" - this is the brief submission that we made at the end of December 2005 to the Road User Charges consultation (rtf file). But there was such an uproar that the Executive announced in March 2006 that they would not approve the plan. The powers to introduce these charges are still in the Transport (Scotland) Act 2001 and so could reemerge at any time. Bizarrely some of the arguing for tolls and "congestion" charges seems to have come from officials e.g. letters published in the Courier on 14th December and Scotsman on 13th December. Perhaps most remarkably of all, it was reported in the Evening News on the 20th July 2005 that a Forth bridge official said "it is not fair that central government should have to pay for it". We wonder what the politicians thought, if this is what their officials were allowed to say. Some Fife politicians had been opposing the tolls for many years:- a Scotsman report of 28 June 1985 (pdf file) includes mention of a certain Doctor Gordon Brown who said that the charging of tolls was "totally indefensible on the grounds of logic, equity and economic rationality". At the time Gordon's views seemed to be shared by Fife Council - their submission to Toll Inquiry 1985 (pdf file). Though in the years since the 1985 Inquiry most of the politicians have done nothing to oppose the tolls and some have collaborated with the authorities. In recent years we lobbied Fife MSPS and councillors to try and persuade them to actively oppose the tolls, examples of our "begging messages" are - Letter to Councillors from George Campbell in December 2005 (Word file) and Message sent to Fife councillors on 17th February 2006. Some of the politicians were already actively opposing the tolls, but unfortunately the efforts from most had been all but invisible. All this changed with the announcement on the 1 March 2006 that the Erskine bridge tolls would stop, but Forth and Tay tolls would remain. Nearly all Fife and Tayside politicians at last realised that they would have to press for the removal of the tolls that affected their constituents. The latest accounts from the bridge authority are for the year ended March 2007. They are available somewhere on the FETA site but it is not possible to provide a direct link to them. �0.8 million from interest and miscellaneous income. After using the �5.8 million, their General reserve reduced to �12.8 million. There are no debts or borrowings on the bridge. In the latter part of 2005 and in 2006, the authorities tried to hide from the people that the tolls were due to end. There was a flood of stories about a new bridge. A petition calling for a new bridge, was started in December 2005 by a member of one of the political parties, who in the discussion forum on his petition said "I do not support ending the tolls" - No surprise there! Many of those who want tolls do not want a new bridge - for the same reason - they don't like roads or road users and want people and goods to be forced to use trains and trams. Their policy is to not build roads, hinder the use of existing roads, spend massive amounts on public transport, and of course have high and widespread road tolls. There was also a group made up of 20 influential organisations, mainly based in Edinburgh, whose prime purpose was to campaign against a new crossing - Forthright Alliance. But in early 2006 this group seems to have gone into hibernation and those with power changed their tune on a new bridge, possibly to distract attention away from the issue of the tolls. Firstly, the existing bridge may be in danger of falling down. This is a risk which only seems to have received great emphasis since the tolls became an issue. If the bridge is in danger of falling down, then that raises questions as to the custodianship of the bridge since it was built, and if it is confirmed that the bridge will have to be closed to traffic, then we would expect there to be an Inquiry as to what went wrong. This would not be to apportion blame, but to ensure that lessons were learnt for future and existing bridges in Scotland and elsewhere. One lesson might be that it would be better if such major structures were looked after by an organisation such as the Executive, which already has responsibility for 3,500 kilometres of trunk roads and bridges, rather than a small single purpose authority which just looks after one bridge, and whose members might be more interested in public transport than in provision of highways. FETA seem to blow hot and cold as to whether the bridge is in danger of falling down. "Flint & Neill", an engineering consultants employed by the Executive looked at the corrosion issue. Initially the Executive refused to release the report, but they released it in March 2006 after a Freedom of Information request from us Corrosion report. The report concluded - "It is our considered opinion that while the corrosion is of serious concern if left unchecked, there is no urgency to limit the loading on the bridge at this time. However, it is strongly recommended that action be taken to protect the cables from further deterioration as soon as practical." So it seems that the bridge is not going to fall down. At least not yet! Despite this, following a campaign by the Scotsman and others it was later agreed by the Executive than a new bridge was needed and would be built. Of course we don't oppose a new bridge, but we don't understand why this decision appears to have been made without any further inquiry or report by experts. The declining traffic does not of course prove that the bridge does have some spare capacity, (though it cerainly proves that for various reasons the traffic numbers are not growing). But there is at least one other major British crossing (the Mersey at Runcorn) which has the same number of lanes as the Forth but carries far more traffic. One difference is that it is toll free. This has two effects. One is that it removes a factor which prevents a smooth traffic flow onto the bridge. The other is that there will tend to be more off peak traffic - tolls uless they are set at penal rates have little effect on peak period traffic. Thirdly, a second crossing may be beneficial to boost the Fife economy. Obviously this would be the case, but what is not obvious is that such a crossing is justified on cost benefit terms. Any such major project would first require various studies and investigations to be done, including into the economic effects. There would almost certainly then have to be an Act to authorise the building of the crossing and to set out what it's financing was to be. If the crossing is justified then we would expect it to be built, and we would hope that MSPs would ensure that it would not take the 20 years that has been mentioned. But we believe that if a new crossing were to be privately financed and tolled then it would never be built. FETA commissioned a report from Faber Maunsell that was oficially published in January 2005 - Report on FETA site (this is a very large pdf file). The report said that if a new Forth crossing was a road only bridge, and assuming "mid range risk" then the cost at 2003 prices would be �300 million including �16 million for "Approach Viaducts". Even before this was officially published the �300 million had somehow escalated to �1,000 million - Evening News 18 June 2004 - "�1bn vision for new bridge over Forth". If you look at the story it actually says that - "A version carrying only cars and other road traffic would cost an estimated �300m.". So how did they get to a billion pounds? Well to get up to a billion pounds, you have to throw in everything including the kitchen sink, and even then you won't reach it. The official report does mention some costs for what are called "approaches", which seem to be - Toll plaza �15M, M9 Link & Spur �45M, Barnton Bypass �70M, "Northern Approaches" �80M. That comes to �210 million, but we would not describe them as costs of building a road bridge. And even that leaves you �500 million short. Could this have been for a stately pleasure dome? Or for a tram line into Edinburgh? But even the feat of turning �300 million into a billion was capped when it was announced only 3 years later that the cost of a new crossing would be around �3.5 billion (or �2 billion per mile of crossing) - Courier 28 June 2007 - Green light for new bridge, but costs soar". The cost of building a new crossing partly depends on whther it is tolled or not. A tolled crossing not only needs toll collection facilities, it also needs a very large area of land on whichever side(s) the tolls are to be collected, this is because you need a lot more lanes on the approach to and exit from the toll booths. The main extra cost though is in the finanncing as a tolled crossing would almost certainly be a PFI scheme and these are very expensive to finance. In our view if a new road only crossing were to be built now then the cost could be as "low" as �500 million, which would give an annual financing cost of �50 million. If however �3.5 billion is spent on the crossing then the annual financing cost would be about �350 million. Adding on the cost of maintenance, repairs, management and toll collection over the 40 years would incraese the annual cost by about �15 million. The current bridge has one way tolls of �1 for most vehicles and carries just under 12 million vehicles a year. Even if they all somehow decided not to use the old bridge or the old bridge was closed, then at a cost of �3.5 billion the toll on the new crossing would have to average about �30 a vehicle. But of course at this rate, no vehicles would use the crossing. The tolled bridge would be a white elephant. Potential PFI contractors would realise this and there would be no bids, no finance and no crossing. Though the bridge makes a profit and the tolls were under review and due to end on 31st March 2006, FETA decided to disregard this and applied for a tolls increase. This was to have happened in October 2004, but there were objections which eventually reduced to one man - George Campbell, "The Lone Protestor". An Inquiry was held in December 2004, but the Minister agreed the increase which was made on 1st May 2005. Full account of the Tolls Inquiry. The question as to whether the Forth bridge tolls were legal was raised by Tom Minogue at the end of 2004. Tom was supporting George Campbell who had made an objection to the proposed tolls increase. Tom's researches found that the legislation under which the Tolls are collected is flawed. This cast doubt on whether it was legal to collect any toll, never mind increasing them. George and Tom then sought a ruling and an "interdict" to stop the Inquiry. This is the submission that was made by George Campbell and Tom Minogue to the Court of Session(pdf file). 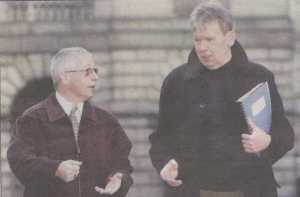 This picture, from Herald & Post, shows George Campbell and Tom Minogue on the 2nd December 2004 outside the Parliament House in Edinburgh, home to the Court of Session. The substantive case on the legality of the tolls was not decided, as the judge determined that he could not give an "interdict" to stop the Inquiry proceeding. In March 2004 George Campbell objected to the proposed increase of tolls from 40 pence to �1.00 on the Forth Road Bridge. This objection triggered a Public Inquiry which was to be heard and determined by a Reporter. In the lead up to the Inquiry the grounds of objection were the subject of some considerable research during which certain deficiencies in the Forth Estuary Transport Authority Order were noted. These matters were then put to the Reporter for his determination in a Stated Case by the objector. At a late stage, only a matter of days before the Public Inquiry Forth Estuary Transport Authority (FETA) objected to the legal content of the Stated Case and asked the Reporter to reject them. The Reporter agreed to FETA's request and stated that he would not rule on submissions concerning the legality of FETA. With literally days remaining before the Public Inquiry opened George Campbell and Tom Minogue sought counsel's opinion and it was decided that they should petition the Court of Session to have the Public Inquiry cisted (delayed) to allow the court to rule on four separate legal challenges to the legitimacy of the FETA Order. In a half-day's emergency hearing at the High Court the Lord Drummond-Young denied the petitioners plea regarding the application to have the Public Inquiry cisted and awarded the costs of the hearing to the Executive. Due to time constraints Lord Drummond-Young deferred ruling on the four substantive challenges to the FETA Order contained in the petition. He stated that they were still before the court and would be the subject of legal review at a future date to be determined by mutual agreement between the parties. The Public Inquiry took place on December 2004 and in due course the Reporter dismissed the objection and recommended the increase proposed by FETA. Some time after this in about June of 2005 the lawyers for the two parties discussed whether, or when the legal review was to be conducted. It was suggested by the Executive that if the petitioners dropped their claim the Executive would waive the costs awarded to them which had been invoiced to the petitioner Mr Minogue in the sum of �3,349.49. Negotiations began and Mr Minogue sought a further payment of �5,000.00 for which he would agree to drop the petition. Agreement was eventually agreed on a payment by the Executive to Mr Minogue of �1,500.00 on the basis that the petition would be dropped. This satisfied Mr Minogue but left the taxpayer footing a bill of �4,849.49. 1. The FETA Order 2002 is vitiated by the fact that it did not proceed through Parliament in a proper manner. Namely there was no Executive Motion for the Order. There had been an Executive Motion for an earlier FETA Order but the Order was revoked and withdrawn by the Executive. 2. The old Forth Bridge Joint Board was not solely concerned with bridge matters and as a result under the terms of the Transport (Scotland) Act 2001 the Executive did not have the power to dissolve that Joint Board. 3. The Executive are empowered under the Transport (Scotland) Act 2001 to transfer the powers of the old Forth Bridge Joint Board to the new FETA they did not have the power to create FETA in the first place. 4. The Executive by not having followed the necessary procedures under the terms of the Forth Bridge Act 1958 to extend the 1997 Toll Order do not have the right to collect tolls which is a burden equivalent to taxation on the lieges and not something that can be extended under the FETA Order 2002. The fact that the Executive were willing to sacrifice almost five thousand pounds of taxpayer's money tells its own story regarding the legitimacy of the FETA Order. A further legal challenge is being considered and a Freedom of Information request was made for the secret reports and tolls correspondence between FETA and the Executive. Some information was received but some was still withheld as it was "not in the public interest" to reveal it. We appealed to the Information Commissioner, who refused the appeal on what we think were invalid grounds. Tom Minogue shared his concerns on this issue with MSPs and he was pleased that they took an interest in both this question of legality and the Tolls extension Order which was subsequently signed by the Transport Minister in March 2006. The bridge authority and the former Executive have had various excuses for keeping tolls on the bridge, perhaps the most common one was that if tolls were removed then there would be congestion. They didn't explain why this road was the only one in Scotland that must be tolled or why they ignored the views of bridge users. In any case if congestion was the issue then there are many things that could be done to reduce it. What is the real effect of tolls on congestion? The former Transport Minister appeared to place a lot of weight on the congestion figures that were produced from the Transport Model for Scotland computer. Computer models do not incorporate time machines or crystal balls and there is little or no empirical data to say what the effect will be of removing the tolls. As computer systems people say it is "Garbage In, Garbage Out". If a model says that traffic will rise by "21%" and congestion will be a lot worse then that is because parameters and assumptions have been used that lead to that result. In March 2006 NAATS asked for two things - the "brief that was given to whoever produced the (congestion) report" and "the output from the model which shows the PM peak and interpeak (congestion) effects for the Tay and Forth tolls". The significance of the request was that all the reported congestion claims were found to be based on the AM peak, but because of the one way tolls, most of the toll queues are in the PM peak. So why did they not publish the PM congestion figures? Or did they not even calculate them, and if so why not? The NAATS information request was refused, we appealed to the Executive and then to the Information Commissioner. On 19 November 2007 the Commissioner gave his decision. The Executive has been asked to release the brief, and it seems that there is no output which shows the PM congestion effects. Users of the two bridges do not accept the congestion claims that had been made, as was pointed out to the Transport Minister in the Parliament. The only recent evidence of the real effect of tolls on the Forth and Tay bridges are the one day strike of toll collectors on 28th March 2006 and the toll increase which was implemented on the Forth road bridge on the 1st May 2005. As was widely reported the effect of the one day strike of toll collectors was that traffic flow improved on both bridges. Just before the 25% toll increase in 2005 FETA claimed that it "would not deter significant numbers of bridge users". That seems to have been correct because the traffic actually increased in the 12 months following the toll increase, though it is still below the peak of 4 or 5 years ago. ( Despite the impression that is given that traffic on the Forth road bridge is spiralling upward, the numbers have been virtually static for the last 4 years - the official figures (only northbound traffic) are (in thousands) - 2003 12,005; 2004 11,781; 2005 11,905; 2006 11,840). FETA at the end of 2005 made a preliminary application to the Minister to increase tolls for Single Occupancy Vehicles (SOVs), the toll for cars was to go up from �1 to �4. The FETA report (dated 25 November 2005) estimated that the effect would be that the number of vehicles would reduce by 4%. If that was the effect of a toll rise of �3, then it is difficult to see how the model predicted a 21% increase in traffic due to the removal of the �1 toll. The model results are useless and misleading particularly as they appear to ignore the congestion that is caused by slowing or stopping to pay tolls. It also seems to assume that people have an inexhaustible appetite for driving, particularly at busy periods! In the real world, people that are drivers or passengers in cars, vans and goods vehicles during peak periods are there because they have little choice, only draconian tolls will stop them. Tolls at less than draconian levels will divert vehicles if there is a practical alternative, but this will tend to mean more miles travelled and the congestion being moved from A to B. In England, there is massive congestion in the West Midlands, yet there is a motorway which is virtually empty because it is tolled. Such a situation does not make best use of the available road space and benefits nobody. Unfortunately it seems that the various "experts" and most of the MSPs still prefer to believe what comes out of the experts crystal ball and are either ignorant of or choose to ignore the evidence that indicates that there will be no significant increase in peak period traffic when tolls are removed. What can be done to reduce congestion? Remove the tolls - The congestion at evening peak is caused by the tolls themselves. Improve the A8000 / M9 spur starting with the Echeline roundabout - A lot of the morning congestion started at the Echeline roundabout, and then tailed back onto the bridge. Work to do this was completed in Autumn 2007 - though it remains to be seen whether they have designed it to optimise traffic flow. Better traffic management - The southbound bridge lanes are clearly marked either A8000 (left hand lane) or A90 (right hand lane), but some motorists use the right hand lane to jump the A8000 queue and then switch back to the left hand lane as late as possible. Often there is no space to rejoin the left hand lane and this results in a concertina effect for those heading onto the A90. Tidal flow could be introduced (three lanes from Fife at morning peak, and three lanes to Fife at evening peak). NAATS suggested this at the Tolls Inquiry in December 2004. The Authority said that it would not work. But the system is used elsewhere in Britain on both tolled and non tolled roads. It is even used on the Golden Gate bridge. Oddly one of the roads that had used tidal flow since 1978 was the Blackwall tunnel. The London Mayor removed it in April 2007, creating congestion in the area - the Mayor claimed that it was done for safety reasons, but Londoners believed it was a preliminary move towards introducing more congestion charges or tolls. Investigate introducing another lane in the gap between the existing two carriageways. Another bridge at Kincardine - This is now being built, but amazingly it will only have a single carriageway, when for little more cost they could have had a wider bridge. It is probably now too late to see if the carriageway for vehicles could be widened. Missing the opportunity for a wider crossing at Kincardine will be an even bigger scandal if the main Forth road crossing is forced to close before a replacement is ready. Facilitate car sharing through various arrangements and promotions, but without the stick of tolls. Park and ride - This is already done, but could be expanded. Encourage employers south of the Forth to have more flexible working hours. Create more jobs in Fife (the removal of tolls will help). Have an independent study into the feasibility and overall effects of possibly using part or all of the Forth rail bridge for buses and / or lorries or all road traffic. FETA applied in August 2004 to "Erect canopy over toll booths at south side of Forth Road Bridge". That was approved by Edinburgh Council in September 2004. The cost of this and related works is �5 million. There are several issues. Another is that instead of building a canopy over the existing booths, they built a vast new tolls plaza about 50 feet away. Following objections from residents in the nearby Stoneyflatts estate, in South Queensferry, FETA made a new application on 14th June 2006 :- "To erect a canopy over the new toll booths and toll plaza at the south side of the forth road bridge". You can see the application at:- Edinburgh City Council. Tom Minogue put in an objection to FETA's planning application on the basis that FETA is not a legal entity as it was not properly constituted in accordance with Scottish Parliamentary procedures. All the objections were thrown out by Edinbugh council. 20th April 2006, report in Dunfermline Press:- "Stop work on toll plaza, Feta urged". The Lib Dem councillor who seems to be Fife's biggest (only?) supporter of tolls, said - "there has to be a traffic management system in place to help filter the traffic from five lanes to two. It would also be needed in cases where traffic had to be stopped from going on to the bridge." We wonder how they manage on the 101 other bridges in Scotland that don't have the advantage of toll booths! On 3rd June, the Courier reported on the "progress" on the plaza, and on the 6th they published a letter from us:- "...Some people might wonder about the sincerity of those who agreed this scheme at a time when the tolls were under review and were due to be removed by March 31. Did FETA know what the result of the review would be, or did they take a �5 million gamble?" On 10th June there was a letter in reply from FETA. They said the �5 million plaza was justified because 1) the toll plaza "wasn't up to scratch for those who work there", 2) "electronic tolling is cheaper" and 3) it had been set up in 2002 "to move from a toll to a road user charge". The Scotsman on 12th June, had a letter from Tony Box of Edinburgh "It is a national disgrace that vehicles are being delayed by more than 45 minutes in trying to cross the Forth Road Bridge northbound, due to lack of toll collection facilities. If the Forth Estuary Transport Authority cannot collect tolls efficiently, it should stop collecting them and let the traffic flow." On 13th June, it was our turn again:- "Last week we asked whether FETA knew that the tolls review process was a sham when they went ahead with the �5 million scheme for new tolls equipment or did they take a gamble. The reply from FETA (on 10th June - see above) misses the point. A review of all Scotland's tolls was announced in May 2003, and there was a first round of consultations in summer 2004. Yet at the end of October 2004 FETA decided to spend �5 million, partly apparently to save money. Even without the review, the tolls on the bridge were due to stop on the March 31, 2006. How were FETA so sure that there would still be tolls when their �5 million tolls plaza opens?" Also on the 13th June, the Evening News revealed that the massive new unwanted toll plaza was being built in a different place to the one that they were granted planning permission for, and that residents had objected:- "Bridge booths face bulldozer as new location takes its toll". The story was in the Courier on the 16th. FETA said that their plans were only "conceptual drawings":- "Shadows loom over wrong-site toll plaza '". The Scotsman on the 14th June had a letter from John Madden of Dunfermline "I agree with Tony Box (letter of 12th) that tolls should be suspended on the Forth Road Bridge for so long as the Fife Estuary Transport Authority fails to collect them with any efficiency. The disruption caused by the closure of toll booths reinforces my view that FETA's main aim is to create havoc. The bridge master's job is to ensure the maximum number of vehicles cross the bridge in as short a time as possible, not the exact opposite." Evening News on the 19th had a letter from Tom Minogue :- "YOUR article on the tollbooths at the Forth Road Bridge being built in the wrong position (News, June 13) comes as no surprise to anyone who has observed FETA's actions at close hand. The bigger surprise is why FETA took a �5million gamble in going ahead with the new electronic tollbooth system when the remaining tolling regimes in Scotland were, and still are under review by the Executive. A visitor from Mars might be forgiven for thinking that FETA is trying to maximise delay, disruption and pollution that is caused by the tollbooth construction work so as to make the case for a new bridge. Surely not!" "BUNGLING roads chiefs have built the Forth Road Bridge's controversial new tolling 'plaza' in the wrong place, it has emerged. Now the �5 million structure faces being pulled down without ever collecting a toll, if angry local residents have their way. ... The towering structure has been erected 15 metres south of the position previously approved by Edinburgh Council and those living nearby complain it has spoiled their river views. Residents have asked West Fifers to join them in their bid to have the new booths removed. ... Even before this latest development, critics had slammed the millions spent as a waste of money, coming at a time when the whole issue of tolls is under review. Politicians of all the main parties are calling for tolls on the Forth crossing to be abolished in line with the Erskine and Skye bridges. And the future of the bridge itself is in doubt because of structural defects, as was made clear last week by bridgemaster Alastair Andrew. ... Local resident Gillian Mitchell first raised the matter with the council after spotting the variation from the original plans. "They've done it because it makes it easier for them to carry on with the old booths operating while the new ones were being built. The new ones were supposed to be built on the same spot as the current ones. When we first raised this, FETA argued that it didn't need planning permission. That's the case for work on the bridge but this isn't on the bridge. They were told they did need permission. FETA have known about this from the beginning of March but didn't stop the work to find out if they would get the planning permission. They kept working through the night, spending public money on booths they knew were in the wrong place. We can't believe they've been able to get away with building this when the whole debate on tolls has been going on. We're always being told that the bridge won't last long so why waste �5 million in public money on these tolling booths which will still be standing when the bridge is shut? There will be around 30 objections from people on this estate and I hope people in Fife will also take the chance to let FETA and Edinburgh Council know what they think about this." The bridge was the least used of Scotland's four toll bridges, but according to the Scottish Executive there were around 750 thousand crossings in 2003. The tolls were some of the most expensive in the world, and even more outrageous if expressed at a per mile rate. The round trip toll for cars was 1140p from 1st May to 30th September and 940p during the winter months. After major protests, Books of 20 (one way) tickets costing �26.80 were introduced from January 1998. The company was reimbursed by the Scottish Executive for the "discount". But the tickets could not be used without the book, and therefore were of no use to visitors to the island. As might be expected there were immediate protests in 1995 and "Skye and Kyle Against Tolls" was born:- Skye and Kyle Against Tolls. The bridge was amongst the first of the notorious private finance schemes and there was a National Audit Office investigation - NAO - "The Skye Bridge" pdf. The scheme was then considered by the Public Accounts Committee - Parliament - the committee's Forty-Second Report extract from minutes of 17 November 2007 meeting (pdf). SKAT's success was helped by support from their local politicians. But the main factor was their long and active campaigning. SKAT was wound up following a final meeting on 23 April 2005. Some of the protestors are still fighting to have their convictions removed. Under possibly unique laws, arriving at the bridge and saying you would not pay the toll was a criminal offence. 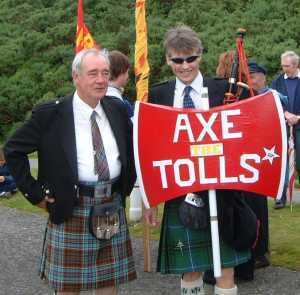 "to celebrate the upcoming Independence of the people of Skye from the financial noose around our neck that is the extortionately high tolls on the Skye Bridge"
Picture on the left shows SKAT general secretary Andy Anderson (one without the axe!) at the July 2004 demo. The Tay was the scene of a major disaster when the railway bridge collapsed in 1879 killing 75 people on the train that was crossing. The road bridge crosses the Firth of Tay from the county of Fife on the south bank to the city of Dundee on the north bank. It opened on 18th August 1966 and is run by a joint board of Dundee (6 members), Fife (5) and Angus (1) councils - Tay Road Bridge Board website. The bridge became toll free from Monday 11 February 2008. The toll for cars had been 80p. From 1 June 1991, the toll had only been payable southbound (going from Dundee to Fife). According to the Tay bridge board 2006/07 accounts there were in the financial year 4,518,000 crossings southbound, which means that the total crossings figure will be about 9.0 million a year. The tolls income for the year ended 31 March 2007 was �3.6 million. Expenditure excluding refurbishment averages about half of the income. Though the bridge only cost �4.8 million to build, the debt on it at 31 March 2007 was around �15 million. In effect the original cost of the bridge will have been paid off long ago, and the debt relates to work done on the bridge since it was opened - on this basis the debt might never be paid off. There are also reserves of nearly �3 million which could be used to offset losses or used for further work on the bridge. We are sorry to say that until recently there appeared to be almost total apathy over the tolls. "Sir,-The Transport Minister's rejection of a plea by the Tay Road Bridge Joint Board for more cash makes it increasingly likely that the tolls will rise on that bridge. When viewed against the proposal that the Forth Road Bridge charges are likely to rise by 25% it seems that the Executive is intent on recouping the revenue spent on the buy-out of the discredited Skye Bridge tolling regime at the expense of 'East-coasters'. It cannot be fair that those of us who by an accident of where we live have to bear the brunt of indiscriminate taxation for the privilege of using Scotland's remaining three tolled bridges. Residents of Fife and Tayside should take a leaf from the book of the islanders of Skye and fight this unjust taxation with all means available." After December 2004 a lot of water flowed under the Tay bridge - we had the removal of the Skye tolls, the Dunfermline by election, the removal of the Erskine bridge tolls, numerous toll studies, and a General election where both the SNP and Tories said they would remove all tolls, and in the 2007 election even Labour and the Lib Dems seemed to say that they would remove the Tay tolls (if not the Forth). But following the formation of an SNP Government the bridge was at last toll free from Monday 11 February 2008. We are grateful to all those who campaigned against the tolls. What a pity that the people of Fife were completely misled and voted for the party that most wanted to keep the tolls. The by-election for the Dunfermline and West Fife seat at Westminster caused the tolls issue to come to a head with all politicians "promising" that tolls will not be increased. Though as the campaign drew to a close, the politicians and their campaign teams were saying that they were "working towards an end to tolls". The reality was that the parties first calling for a freeze on tolls, and then "no tolls" had no intention of making their words come true. Where were those candidates when the Forth tolls were increased in May 2005? - Not a single one voiced their opposition. Many individual councillors and MSPs want tolls removed, but their views are stifled by the party machines. At the start of the campaign, we had contacted the Labour, Lib Dem, and SNP by-election candidates asking where they stood on the removal of tolls. They were reluctant to let the people know their views, so there was a "No Tolls" candidate for the by-election - Tom Minogue from Dunfermline. Unfortunately the other parties stole Tom's clothes by pretending to be against tolls, and much of the news media concentrated on the personalities and ignored the facts. BY-ELECTION NEWS is on Scotland News 2006 Page from 17th January to 12th February Details of No Tolls candidate Vote Flyer Scottish politics web site (link to the by-election is on left of page). 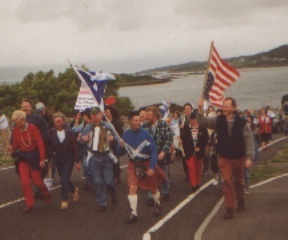 When the NAAT was formed early in 2004, its Scottish part was SKAT who had been campaigning since 1995 against the "sky high" tolls on the Skye bridge. Then in June 2004 a letter from the alliance was published in some Scottish papers, it ended - "We would welcome Scottish groups, or individuals who are interested in forming campaign groups." There were only TWO responses to the letter. One was from a driver in Fife - Mike Arthur. The other letter led to a contact with Dr Alan Werninck of the Lothian branch of the Association of British Drivers. Alan had been ill and unfortunately died soon after but he put the alliance in touch with the "Lone Protestor" from Fife - George Campbell - who had put in an official objection to a planned increase in Forth bridge tolls. George was criticised for his stand by the authorities and this inspired another Fifer - Tom Minogue - to research the history of the tolls. He discovered that the tolls should have been removed by 1996 and that their subsequent extension was possibly illegal. At the Toll Increase Inquiry in December 2004, George was supported by just two people - Tom Minogue and John McGoldrick on behalf of the alliance. Not a single politician opposed the toll increase yet alone said that tolls should be removed. The Forth toll increase was agreed by the Minister and came into force from May 2005. In the meantime SKAT had at last seen a successful end to their campaign with the Skye bridge tolls being removed without notice on the 21st December 2004. The alliance had also got involved in the campaign against a proposed congestion charge in Edinburgh. The toll had been put forward by the Labour Council, partly on the basis that it would help to pay for a tram scheme. It was widely believed that Edinburgh Council was the main cause of traffic congestion because of the many anti car measures they had taken which reduced road space. The Edinburgh toll was opposed by the Tory and Lib Dem councillors. It was also opposed by some local businesses, though with one exception - Thom McCarthy, the American born owner of a stores business - they were too afraid to actively show their opposition. There was also opposition to the tolls from a community group led by Kristina Woolnough. The group mainly opposed the toll scheme because traffic would divert onto residential streets to try and avoid the inner toll cordon. The alliance was the main source of information to counter the massive pro tolls propaganda that came from the Edinburgh authorities and various establishment and "green" interests. The "No tolls" side won the referendum that closed on 22nd February by a margin of three to one. After the removal of the Skye bridge toll, the future of the remaining tolls (Clyde at Erskine, Forth and Tay) was the subject of various reviews and studies by the Scottish Executive. The alliance submitted evidence to the reviews and also lobbied local and national politicians. The usual interests were of course fighting hard . They not only wanted to keep the tolls, but the authority who ran the Forth bridge were proposing that some drivers should pay a toll of �4 rather than �1. The issue came to a head when a by election was held on 9th February 2006 at Dunfermline in Fife. Tom Minogue stood for the alliance as an anti tolls candidate. He did not get many votes - because all the other candidates claimed to be converted and now opposed tolls! Despite the resistance from the tolls establishment, the Clyde tolls at Erskine were removed from the end of March 2006. It was rumoured that when the Skye tolls had been removed it was partly due to Lib Dem pressure and that there had been a deal that Labour could have the tolls removed at Erskine. Whether the rumour is true or not, the campaigning of the local politicians on Clydeside certainly made a difference. The only tolls now left were the Forth and the Tay at either end of Fife. Nearly all the politicians in that area had largely ignored the toll issue, but were now concerned as to the "special" treatment that Fife was receiving. By the time of the Scottish elections in May 2007, all the parties were saying that they would remove the Tay tolls, but only the SNP and Scottish Tories said that they would scrap the lot. The result of the 2007 election was that the SNP had one more seat than Labour and formed a minority Government. A new government which honoured their election promise and put forward a bill to abolish the tolls. There was continued pro tolls lobbying and claims that the removal of the tolls would cause gridlock on the bridges. Most of the MSPs seemed to believe these dire predictions but almost all of the MSPs realised that the tolls had to go anyway and eventually passed the bill in December 2007. Scotland became completely free from tolls from Monday 11th February 2008.